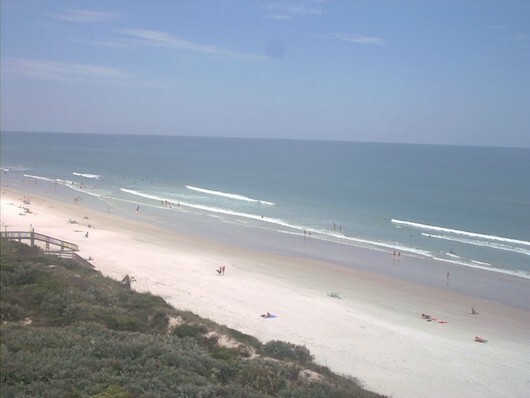 New Smyrna Beach is another great beach for running in the area. The beach is 17 miles long and features both soft sand and hard packed sand — not quite as firm and flat as neighboring Daytona Beach. The northern end of the beach is at Smyrna Dunes Park, and stretches south for 17 miles, where the beach actually continues as part of Canaveral National Seashore. The heart of New Smyrna Beach, and its more commercial area, centers around Flagler Ave. at the north end, south for 3 miles to the Sea Dunes area near the Indian River Lagoon Park. If you get tired of the beach, there are numerous residential side streets between the beach and Saxon Dr. that make for quiet, traffic-free running — not hugely scenic but a decent option. As an added treat, the 1.6 mile boardwalk trail at Smyrna Dunes Park is fantastic for running. The trail leads through and over dunes, with scenery that includes ocean views, some shaded canopy, sections of desert-like terrain, and views of the Ponce Inlet and lighthouse.